I love beans. They’re good for your heart. The more you eat them, the more you….uhhhhh. Yeah. I always try to keep beans on hand in the freezer. It’s nice to have them at a moment’s notice for recipes like nachos or soup. I’ll make up a big batch in the crock pot and then freeze them in 1 ½ cup portions (the equivalent of one can). 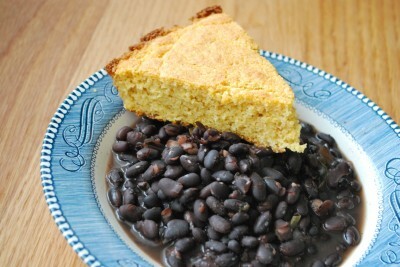 But we also like having beans with cornbread on Meatless Monday. I served these fresh out of the crock with cornbread for dinner – and then I froze the rest for use at a later date. They are SO GOOD. I love beans…they’re good for your heart, remember? It’s so easy to prepare your own beans – they’re a lot cheaper when you buy them dry. Soaking them overnight isn’t hard. It just takes a bit of advance planning. This is where meal planning comes in very handy. When soaking beans, always make sure to cover them with a TON of water. It’s better to have too much water than not enough – you need at least 3 times their volume of cold water. Let the beans soak overnight and drain in the morning. Proceed. The more you eat, the more you. Uhhhh, yeah. Okay, so guess what? I buy canned tomatoes. Shocking, I know. I’ve been preached at my numerous people about how BPA in cans is going to make me die a slow, agonizing death – my teeth will all fall out and I’ll shrivel up from the inside out. I like to buy organic tomatoes when I can, but we can’t afford glass canned tomatoes on our food budget. Muir Glen Organics now has BPA free cans, so hip, hip, hurray! 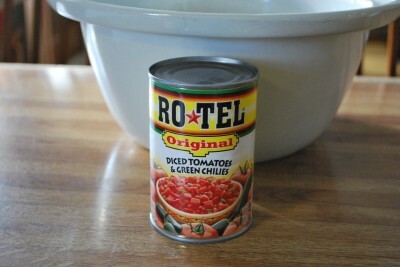 But anyway, I like Rotel in my spicy beans. So, I buy Rotel. Shoot me. I figure occasionally is okay with me (Rotel, that is, not shooting me). But, if you don’t want to buy Rotel, you can easily make your own. Either way, just make these. They’re good. You can serve them with skillet cornbread or use them as a side to tacos, enchiladas, or fajitas. 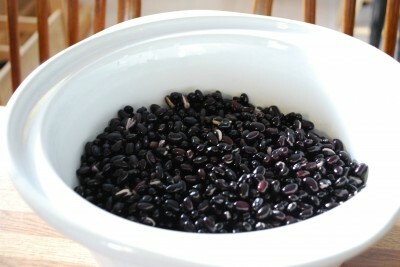 Rinse beans and soak overnight in water (3xs the volume of the beans). Drain beans in the morning. Add to 4-5 quart crock pot with chicken broth, onion, pepper, tomatoes, cumin, chili powder, and salt. I am making this as I type. Here’s hoping your recipe is foolproof, because this fool has never successfully made dried beans before. Oh gracious. Now I’m nervous. That time didn’t work out but I think it was because the beans were older your average 1st grade student. It has worked almost every time since. In fact, I am making it for dinner tonight. Thanks. Thanks for this recipe! 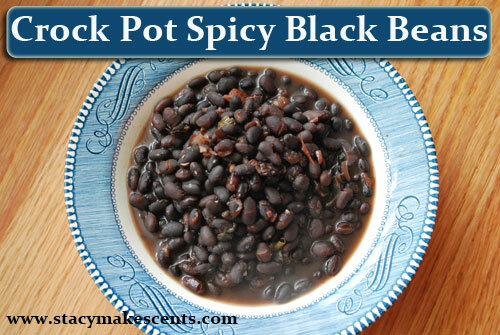 I love using beans too and I love crock pot recipes too! You are awesome! I just bought your crock pot cookbook and LOVE it! I am so happy you encourage moderation and common sense and don’t get hysterical over every.single.thing! I think we have to do the best we can. I think some people become so preachy with the real foods movement that it scares others off because they feel they can’t do it all, all the time. (Heck, sometimes I feel that way myself.) I’ll never forget your post on food not being your god. I refer back to it when I get overwhelmed. So, I just want to thank you for all you do and for keeping it REAL! 🙂 Thanks for the smile this morning. If you’re using a crock pot, there’s no reason to soak your beans overnight. I just rinse mine and put them in the pot in the morning, then add the rest of the ingredients after a few hours. Come live here for a bit and you’ll think of it. LOL BAHAHAHAHAHA! Okay, was that gross? I don’t use rotel but I make mine the same way. I add lots of jalapenos- I live on the wild side. Barry LOVES jalapenos! Breastfeeding prevents me from that right now. 🙂 A good nose run is nice though.